It had been a long while since the last time I was able to get to El Rey Del Sabor. 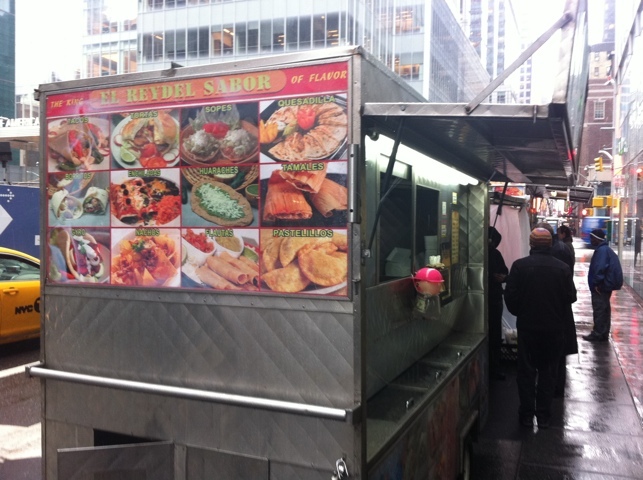 The self-described King of Flavor operates three trucks that consistently churn out surprisingly good Mexican food. 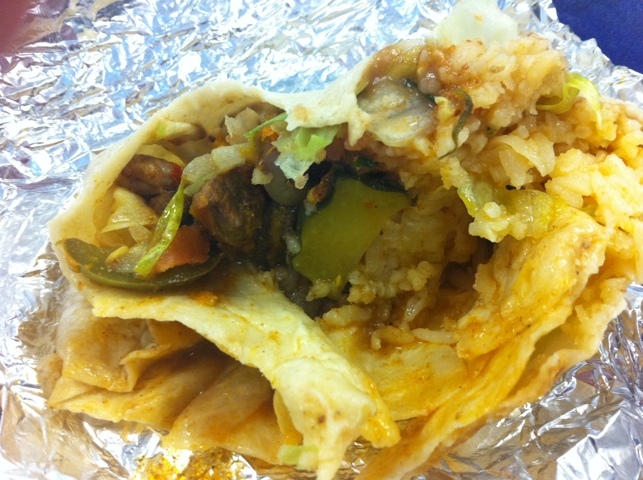 This time I put myself in the hands of the two gents working in the cart, who recommended I get a spicy pork burrito. 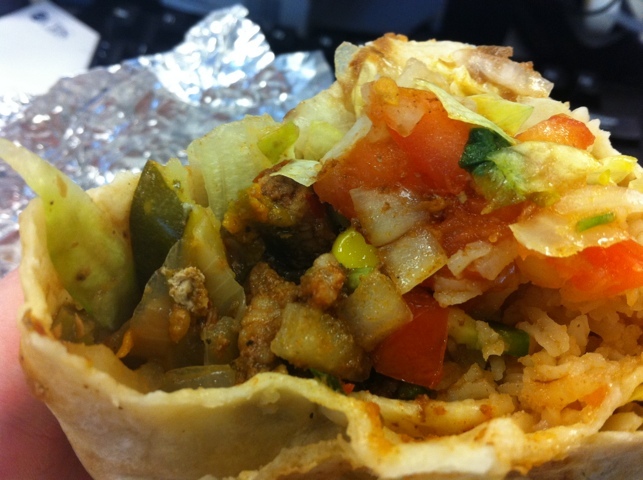 That's a pretty burrito. Notice the slightly brown, grilled tortilla. It’s a whopper. Look at the size of it. 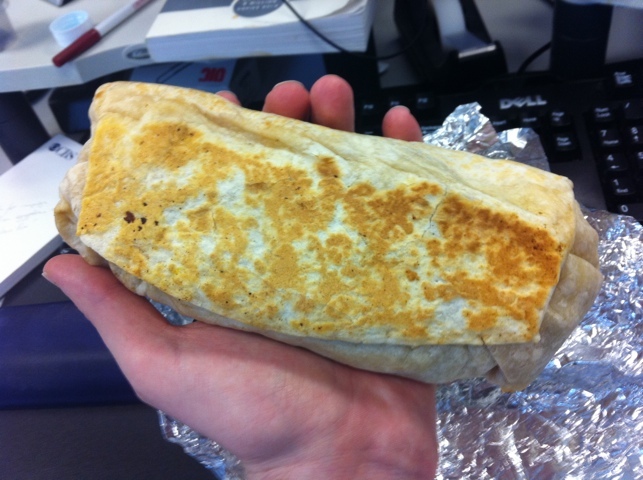 Kudos to them to grilling the burrito itself a little once they folded it up. It gave the wrap a nice golden color where it lay on the grill, and heated the rice within. Among the pork, on the left, you can see some of the "Pumpkin Flower." The spicy pork flavor itself is a medium heat, that won’t make you break into a sweat. That said, the tingle on the tongue may be enough to help unplug your sinuses. I should mention this is the first spicy pork I’ve had since dining on the Korean version of it several times, and I was reminded how the sweet and sour note of the Korean spices and sauces really adds something to it. 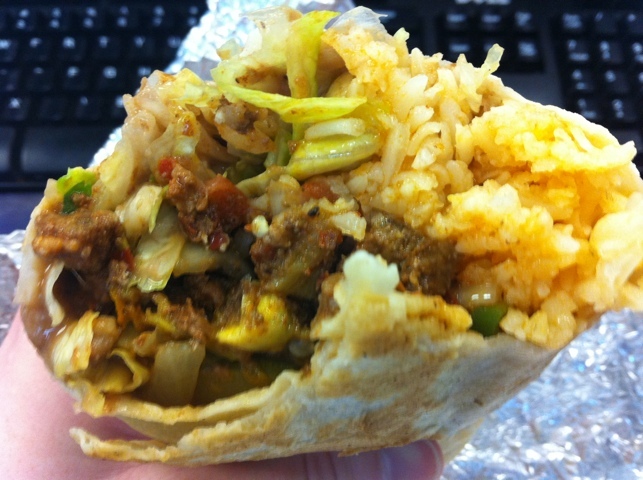 That’s not a knock on El Rey, though, which was still very tasty. The generous serving of rice adds a cooler, mellow note to the mix of lettuce, pico de gallo and spicy pork. Pumpkin flower on the left, pico de gallo on the right. Tasty. The burrito is filled with the typical ingredients: a generous serving of rice, some pico de gallo, cheese, the spicy pork, but the folks working the grill clued me in to something special, the “pumpkin flower.” The pumpkin flower is a mix of squash, onions and other veggies that serves to awaken and round out the various flavors at work in the burrito. The onions add a sweet, the squash a richer heartiness that opens up the smokiness of the spicy pork. Of course, the pork is very rich, and I think I picked up a hint of a mole sauce flavor, though I didn’t see them add any. At the end of the day it’s a ton of food. I couldn't really finish it, it's a lot of food! I’m looking forward to going back and getting a trio of tacos, which they slather with some cheese and sauce that’s just sensational. Certainly the least dietetic meal I’ve had for lunch in a while.